on 13 May 2012 in Turin. This article was published originally in October 2011. Listed statistics at the bottom of this post were as of that date. 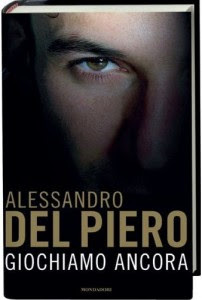 I have added information about Del Piero's new book that was recently released. According to Gazzetta dello Sport on 12 May 2012, last Sunday versus Atalanta at Juventus Stadium was Del Piero's 478th game in the Serie A for Juventus. According to Corriere dello Sport on 19 May 2012, Juventus will don a special shirt/kit in the Coppa Italia final to honor Del Piero's first game for Juventus on 12/9/1993 and his last, 20/5/2012. 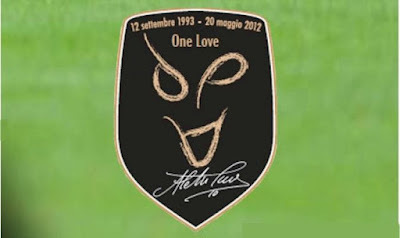 It will also have a black Scudetto symbol with "One Love" inscribed. Del Piero played 705 official games for Juventus according to Gazzetta dello Sport. "12 September 1993, 20 May 2012. Two dates. One love. That is what tied and will always tie Alessandro Del Piero and Juventus. The dates are of the first game of the Juventus captain, almost 19 years ago, against Foggia and the last one, Sunday, against Napoli. There will be inscriptions on the patch that will be worn by the Juventus players during the Italian Cup final. Together with the phrase, 'One Love.' And this is how the club and his teammates will honor him. With a simple gesture, but one that displays in the best way how much Alex and Juventus mean to each other. Nineteen years with one love inscribed on a special shirt and in one's heart." Alessandro Del Piero in action last October against Chievo Verona. He came to Juventus at the age of 19 in 1993 and was christened, "Pinturicchio," by the legendary Juventus FC and FIAT owner, Gianni Agnelli. From the many triumphs and bitter defeats that followed, along with a humiliating descent into the Italian Serie B, Del Piero has been as constant as the sun rising and setting over the Alps. Del Piero is cut from a rare cloth in a modern era of annual transfers by mercenary-like players. He wears the white and black colors of Juventus like a second skin. He is the "l'uomo simbolo", or flag bearer, held in high regard by teammates, fans, managers and opponents around the world. Andrea Agnelli, President of Juventus FC. "L'unico legame tra le varie case della Juve è il nostro capitano, Alessandro Del Piero, che ha voluto rimanere con noi ancora un anno per quello che sarà il suo ultimo anno in bianconero". "The only tie between the various units of Juventus is our captain, Alessandro Del Piero, who wanted to remain with us another year for what will be his last season in our colors." Ci potrebbero essere la possibilità di ripensamento sul contratto di Del Piero? "Era negli accordi l'aveva detto Alessandro per primo che quello di maggio sarebbe stato l'ultimo contratto con la Juve. Da parte nostra è stato un giusto tributo a quello che il capitano ha rappresentato per la storia della Juventus". Un futuro da dirigente? "A momento debito ne parleremo". Would there be a possibility to reconsider Del Piero's contract? "It was in the agreements that Alessandro first said in May (2011) it would be his last contract with Juventus. From our part, it has been a just tribute for what the captain has represented in the history of Juventus." A director's role in the future? "At the right time, we'll discuss it." "Era giusto e doveroso, essendo in assemblea tributare un ringraziamento per quello che il capitano ha rappresentato. Farlo alla presenza del presidente Boniperti, che ha siglato il suo primo contratto con la Juve, e con me che ho firmato l'ultimo, credo che sia un riconoscimento dovuto a un grandissimo uomo e un grandissimo capitano". "It was proper and necessary being that it was at this shareholder's meeting to make a tribute to what the captain has represented. Doing it to the presence of President Boniperti who signed him to his first contract with Juventus, and with me who signed him to his last, I believe that it is a necessary acknowledgment to a great man and a great captain." “L’uscita di Agnelli su Del Piero non l’ho capita. Alessandro quando gioca è uno che dà sempre fastidio alle difese e tecnicamente è ancora il migliore. E’ un gioco a farsi male, si sta facendo di tutto per demotivare il giocatore. La società avrebbe dovuto dire queste cose a marzo o aprile, non ora. Non c’entrava nulla fare queste dichiarazioni adesso, non ho capito quest’uscita e chi ha suggerito Agnelli e lo stesso presidente hanno fatto un errore terribile”. "I didn't understand Agnelli's coming out about Del Piero. Alessandro, when he plays, is one who always troubles defenses and technically, he's still the best. It's a game (by Agnelli) to make things bad for him. He is doing everything to take away the motivations of the player. The club should have said these things in March or April. Not now. Nothing was called for to make these statements at this time. I didn't understand who suggested this ploy to Agnelli and the same President who committed a terrible error." “Il modo in cui si liquida un giocatore che ha dato tanto alla Juventus è sbagliatissimo. Ognuno si comporta come crede, se Agnelli ha detto così probabilmente avrà parlato giù con i cugini (la famiglia Elkann). Sono convito che Del Piero possa dare ancora molto. Conoscendolo non si tirerà indietro, ma senza dubbio sarà demotivato”. "The way in which a player who has given so much to Juventus was cast aside was handled in the worst way. Each person behaves as he likes. If Agnelli spoke like this, he likely will have spoken with his cousins (the family of John Elkann). I'm convinced that Del Piero can still give a great deal. Knowing that you can't go back, but without a doubt, he will be less motivated." Francesco Totti in action for AS Roma. "La felicità professionale e personale di Alessandro viene prima di ogni cosa. Ma affrontare la Juve senza Del Piero, se dovesse accadere, non sarà mai la stessa cosa. Circa venti anni di sfide sportive sono tante, ma davvero tante: ognuno di noi le ha vissute sempre e solo con la stessa maglia". "The professional and personal happiness of Alessandro comes before anything else. But to face Juventus without Del Piero, if it should happen, will never be the same thing. Almost 20 years of sporting challenges are a lot but really so many. Each of us has always and only have experienced them wearing the same shirt." According to La Gazzetta dello Sport on April 19, 2010, Del Piero received and evaluated an offer from the New York Red Bulls. He later denied such an approach, but his interest in the USA, especially his passion for NBA basketball, is well-documented. Del Piero met with the Boston Celtics in Rome during October 2007. He also has a strong affinity for Japan and was one of the first footballers to lend a hand after the recent earthquake and tsunami. Some men wear a shirt. For others such as Alessandro Del Piero, the shirt becomes a part of them. Another player may don the famous #10 shirt of Juventus, but he will never replace the class, dignity, elegance, endurance, loyalty and technique of Alessandro Del Piero. The electrician's son brightened up more lives around the footballing world than General Electric. Please click the image to read my book review. The Juventus legend has released his autobiography, Giochiamo Ancora (Let's Keep Playing). It was co-authored by Maurizio Crosetti, who is a Turin-based sports journalist and author who writes for La Repubblica. "Attendiamo tutti questo libro, lo attendo pure io che ho collaborato tanto per dirvi di quanto è interessante questo lavoro. Vale la pena comprarlo perchè permette di capire il Del Piero uomo, insieme ad Alex abbiamo parlato del talento, della vita e della famiglia. Lo conosco da tanti anni ma lui è un personaggio che ti sorprende sempre, nelle parole e nella scelta dei vocabili è veramente eccezionale mostra ogni volta una cultura di un livello altissimo. "All of us awaited this book. Even I who also collaborated a great deal to tell you how interesting this work was. It's worthwhile to buy because it allows you to understand Del Piero the man. Together with Alex, we spoke of talent, of life and of family. I've known him for so many years but he's a personality that always surprises you. In his words and choice of vocabulary, he's truly exceptional who shows each time a very high cultural level." "Quest'anno posso dire che spesso si è morso la lingua facendo il bene della Juve e anche il bene di se stesso, è rimasto Del Piero fino alla fine ed anche Andrea Agnelli glielo riconosce. Posso svelarvi un aneddoto che mi ha raccontato, qualche anno fa Del Piero andò al carnevale di Venezia e si mascherò da Uomo Tigre anche per non farsi riconoscere con la maschera del popolare cartone animato comprata in Giappone. Nonostante ciò andarono da lui alcuni turisti giapponesi a chiedergli l'autografo ma non come Del Piero, capitano della Juventus, ma proprio come Tiger Man". "This year I can say that he frequently held his tongue for the good of Juventus and himself. He's remained Del Piero to the very end and even Andrea Agnelli recognizes it. I can reveal an anecdote that he told me. A few years ago, Del Piero went to the Carnival of Venice and dressed up as 'Tiger Man' (one of the popular Japanese anime characters) so that he wouldn't be recognized. Not withstanding that many Japanese tourists asked him for an autograph not as Del Piero, the captain of Juventus, but as Tiger Man." Italian source: Alessandro Vignati, TuttoJuve, 18 April 2012. 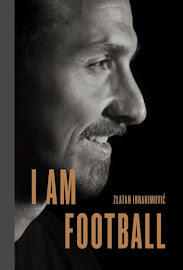 I discussed this book and Alessandro Del Piero on Mad About Futbol, Episode 6, on 16 July 2012. Please click the link to listen to my commentary which begins at the 45 minute mark. (I also discussed Michael Bradley's move to AS Roma).